Sharon Patrick (right) and her husband Rich, grandparents and legal guardians of Jimi Patrick, one of Cosmo DiNardo's four victims, greets Melissan Fratanduono-Meo, mother of another DiNardo victim Tom Meo, prior to PA State Rep. Helen Tai (D – Bucks) starting a press conference at the Solebury Township Building July 31, 2018 where she announced she will be introducing three gun safety bills into the legislature this fall. At left is Solebury Township police chief Dominick Bellizzie. Relatives of two of the four young men who were murdered by Cosmo DiNardo one year ago stood with lawmakers Tuesday to push for stricter gun laws, measures lawmakers say could have prevented their sons' brutal slayings. At the Solebury Township building, three miles from where the killings took place, relatives of Jimi Patrick and Tom Meo joined State Reps. Helen Tai (D., Bucks) and Perry Warren (D., Bucks) to announce the potential legislation, which would require gun owners to securely store their firearms while living with someone who has been involuntarily committed for mental health treatment. DiNardo, who had been involuntarily committed for treatment of schizophrenia, used his mother's .357-caliber Smith & Wesson handgun in the killings, according to authorities and court documents. Through an attorney, the DiNardo family declined comment Tuesday. PA State Rep. Helen Tai (D-Bucks) closes her notes after she announced at a press conference that she will be introducing three gun safety bills into the legislature this fall. Others at the press conference are (from left) PA State Rep. Perry Warren (D – Bucks), Solebury Township police chief Dominick Bellizzie, Rich Patrick, Melissa Fratanduono-Meo, and Sharon Patrick. Sharon and Rich Patrick, the grandparents who raised Jimi Patrick, and Melissa Fratanduono-Meo, mother of Tom Meo, stood behind the officials as they spoke but did not comment. "Few of us can comprehend the horror these families experienced, and it is my fervent prayer that none of us ever has to," Tai said. "But yet it is a grim episode that we as a state and nation have watched happen too many times. A person who never should have been able to access a firearm somehow does so with horrifying and heartbreaking results." The package of legislation remains in its nascent stages. Tai said she would begin seeking cosponsors after Tuesday's news conference. Historically, gun-control measures have failed to find bipartisan support in the Pennsylvania legislature. If these were to defy the odds and pass, the laws would also require that weapons be secured when not under "direct control of the owner," Tai said, and mandate that gun owners report the loss or theft of a gun within 24 hours of discovering it missing. Criminal penalties could result if gun owners fail to do so, Tai said. Warren said that he would be reintroducing a universal background-check bill, similar to one that died in the House Judiciary Committee in June on a 14-13 vote. A March Franklin & Marshall poll indicated that 86 percent of Pennsylvanians support tougher background checks. 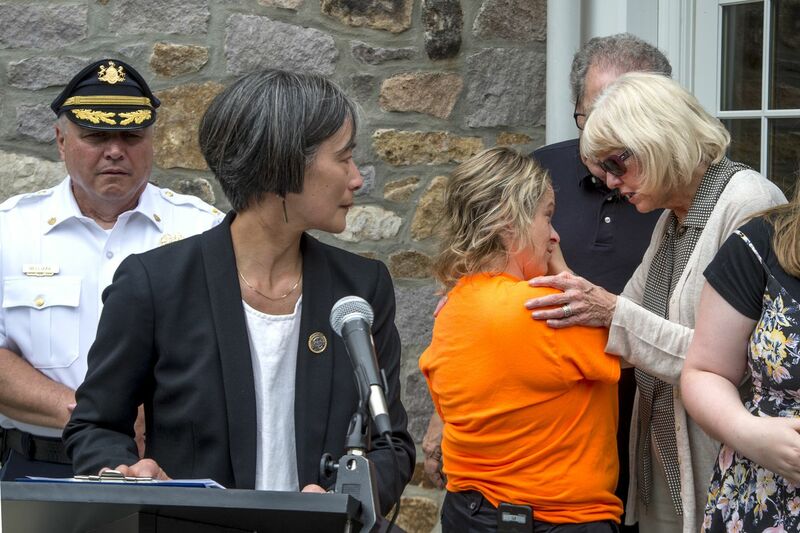 Tai, who was a Solebury Township supervisor when the murders occurred, said a recent Mom's Demand Action panel of local gun owners and non-gun owners found "common ground" on two issues: universal background checks and safe storage. Massachusetts has the strictest laws regarding storage, requiring all firearms be stored with a lock. New York, Connecticut, and California require guns be stored with a lock if the owner lives with someone is prohibited from accessing them, according to the Giffords Law Center to Prevent Gun Violence. "I cannot imagine the anguish these families have felt," Tai said, "but if we can prevent one more death from gun violence, if we can prevent one more family from suffering the loss of a loved one, then perhaps we as a society will have begun to properly honor their sons' memories." Last July, DiNardo, 21, of Bensalem, lured four young men — Patrick, Meo, Mark Sturgis, and Dean Finocchiaro — to his family's Solebury Township farm. In DiNardo's confession, he told investigators that his victims thought they were there to buy marijuana. Instead, he fatally shot and buried them. He and his cousin Sean Kratz, also 21, were charged in the murders. DiNardo pleaded guilty in May and is serving four consecutive life terms. Kratz, his alleged coconspirator, balked at his chance at a plea deal. His trial is expected to begin next year. All four victims' families have filed wrongful-death suits, contending that DiNardo; Kratz; DiNardo's parents, Sandra and Antonio; and their family companies share blame in the killings. Four photos, from left, of Jimi Patrick, Tom Meo, Dean Finocchiaro, and Mark Sturgis placed in a kitchen cabinet window in the Newtown home of Patrick’s grandparents.